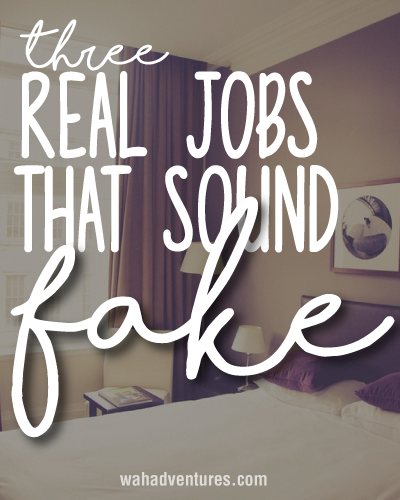 We talk all about working from home and telecommuting here at wahadventures and to be honest, most of these common jobs seem too good to be true in themselves. Many of us find it to be very difficult to find the right fit for our individual circumstances and needs. But the following three jobs are intended to be jobs you can only dream about! Netflix offers a telecommute position titled Taggers and it sounds great for the binge watchers. According to CNBC, Netflix taggers are paid to watch hours upon hours of movies and tv shows and then help humanize the viewing suggestions. You know the, “because you watched Making a Murderer you probably like these shows…”. I have no idea what these Netflix taggers are paid to watch tv and categorize and tag the shows and movies, but I wouldn’t care, if I ever had the chance at that job- I would be fighting over it like Black Friday towels in Walmart. One very lucky college student was paid roughly 28k to spend 6 months taking all-expense paid trips all over the world to test out waterslides at theme parks. The process of choosing the waterslide tester was probably more involved than the job itself. It took 5 months to narrow the job down to one person in their contest-like challenge that began with over 2000 applicants. This job was handed out in 2013 and as far as I can tell, there hasn’t been any more slide tester positions open at First Choice. The job entailed traveling to 15 countries where 186 waterslides were tested for both splash and adrenaline factor. Lucky guy. In 2013 a hotel company in Finland sought out a professional sleeper to test out the comfort of their hotel rooms and then blog about it. The gig lasted 35 days and the professional sleeper had a nice summer break, paid for! The company hasn’t offered the position again. Even if another job like this does come open again. There will be a lot of competition. This particular job required you to speak English and Finish fluently, with Russian being a plus. There were at least 600 applicants. A waterslide tester?! This is INCREDIBLE. I’d sign up for this in a heartbeat. Thanks for the fun post, Miranda! Those are some rare and creative jobs!